I had been losing heart recently about something I love doing. Then- at breakfast last week with one of the most powerful media industry leaders in Australia- he said something that gave me the compass point to getting my mojo back. Simple. Powerful. It’s a secret to success. A colleague asked me to join him at a breakfast meeting in Melbourne with a genuine icon of the Australian media industry. I jumped at it. A long-time friend of our group, this leader had agreed to share his thoughts on how to build long term success in doing business in Indonesia, where the company has a market leading digital capability. He did not disappoint-with wisdom and insights literally flowing off his tongue. But it was this throw-away line that I grabbed and have used to help me get something very close to me back on track. I’ll tell you what it is- what he said- and then explain the story around it. I needed that. You see- for the past few months, I have been losing heart in this blog, Possums. Subscriber and follower levels were not increasing- or at the most, inching forward….7,201…..7,202…. The number of retweets and sharing of posts via social media was dropping. The amount of negative feedback via emails increasing. Every day I’d get ..’ping’…. another notification or two of people unsubscribing (usually because they had left their employer and their email address was defunct, but still….). 7,201….7,200….7,199……Point is, I was kind of feeling ‘spent.’ Struggling to find content, and it seemed to me, the audience was drifting away. So- I stopped writing for a while. A senior HR executive emailed to ask whether – having read an idea in a Possums post- we had a capability in a certain employee communications area and could we help her company roll out blah blah blah…… I am seeing her in Melbourne later this week. I received an invitation to speak at a conference in March 2015 attended by 100 plus CEOs of the largest foreign owned companies in Australia- some clients, many juicy prospects. The conference organizer mentioned in the invite that she is a Possums reader and wanted me to cover some content she had read in a post. And then, last night- an email from a very senior businessman. His son apparently was at a talk I gave (based on material developed for Possums) last week, and had mentioned his reaction to the talk to his Dad. As a result, this invitation to speak in two weeks at this client’s annual leadership meeting of his top 60 public affairs and marketing team. Two of our companies already work with them. Two others are pitching big work. Perfect timing. So- my heart has lifted. I have realized that by keeping on schlepping around- to keep going, even if it feels like progress is limited and outcomes marginal for a while- … by keeping on, good things come from it. Very good things. Things that add value- to individuals, businesses, my own tribe. And importantly- for myself. Things that pump my tires in a world where we’re surrounded by static that deflates. Frankly- I need the positive reinforcement. Not sure why. No doubt it’s not flattering. Don’t care. It’s me. Here’s the point: “Keep turning up.” Woody Allen says it’s 85% of the secret of success- just turning up. Persistence. Consistency. Determination. Relentlessness. Even when you don’t feel like it. Even when you don’t think you are making a difference. Keep schlepping around. Good things DO come from it. You ARE making progress, ARE making a difference. Promise. Are you getting enough ROL? The Trust Test: Do You Pass, or Fail? Cliches for the right reason! I have just become a Wrestling Possums follower and loving your posts. As an ex Marketing Exec now mom and active community volunteer in crisis communities. I have come to realize that you do not have to be in business to get value from your posts Chris doing anything worthwhile requires motivations,inspiration and “turning up” to make a difference even if it seems like a drop in the ocean. Great post Chris!! I often tell myself to ‘keep moving’ even when you don’t feel like it because somewhere along the line your persistence pays off!!! Hi Chris, please keep ‘schlepping’ because I’m sure there are many ‘fans’ of your blog – like me – who look forward to your pearls of sense, guidance, reassurance and wisdom who take what you give us and don’t say anything. But don’t think we don’t use those pearls. I regularly pass on your blogs, or parts of them to my team. Contributing the content that you do isn’t easy. Perhaps the Possums can give you some ideas of where would appreciate a different perspective. Please, don’t stop. There is so much rubbish posted, tweeted, ‘shared’ daily – people just share to feel like they’re part of the game but your content is valued. Thank you. Great post Chris, can’t agree more – the more you grind, the more opportunities will come your way. Chin up and crack on boss. Thanks Jim- appreciated. One correction- in my case, it’s ‘chins up’, sadly! Great post Chris, often just by maintaining the grind, opportunities come further down the track. You are too harsh on yourself, 7000 following your blog, you have earned a place of respect. Be sure to be grateful. Sometimes we get jolted by things when we most need them, you have written on several instances like that. Probably like many reading your blog I find my own reflection and relevance on a busy journey and am guilty of not commenting and moving on. Keep up the great work! Thanks Chris. I needed that. I met you several years ago around 2007/8when I applied for a role, I succeeded and then something happened and the role didn’t exist : ( despite this I have never forgotten your integrity and kindness. In fact I went on to work for Council on the Ageing and I contacted you for pro bono assistance which was to provide free media training ( thanx Sam North) and PR for grandparents day. What an incredible company you have fostered and nurtured. Please don’t be disheartened you are a good man doing great things in the world. Great post Chris. Keep on keeping on! Love I, Oscar! Hope you are well and happy. Zenos soon? I am sat in Jakarta, where I am spending yet another week, schiepping around. It has taken 30 months but we now have a team of 35 doing some great work for some demanding client, profitably. Schiepping works! I read your posts and delight in the concise, light hearted truisms. Please preserve. Hi Chris. You’re blog’s a great example of what I want mine to be. Genuine personal insights that join the dots, and not just a “carrier pigeon” for other people’s ideas to get the numbers up. Keep blogging….. I loved this post and I have certainly felt the same as you, losing heart with my work as a HR Director and losing heart with my blog. The keeping schlepping around is such a good term to remind us that sometimes we just have to keep keeping on and then we get to experience “unintended consequences” where people make connections and we get opportunities to do the things we love that give us energy and heart. Thank you. I love your posts, and often share them on LinkedIn or forward them to people I know would appreciate them. I also know how hard it is to write a blog, so I really respect and value your efforts. It is always a wonderful thing to see a Possum email in my inbox! Thank you so much. And thank you for explaining what schlepping means. 7,000 is a lot of followers, and there are probably many others that you don’t know about…. Thanks, Chris. Great words of inspiration again. Hope you keep the passion alive for Possums – it’s more valuable than you probably think. The batteries are recharged and ready for another ‘schlepping’ assault – many thanks. Your post couldn’t have come at a better time. I have been in ‘schelp’ mode for a while, and it was getting me down. This morning, I received an unexpected but very welcome piece of news that my ‘schelpping’ has paid off. Your truisms inspired me to stay and schelp in this industry many times throughout my career, and for that I am immensely grateful. Please take heart in your posts. Each post is as much a rallying war cry for you, as it is for the rest of us. Very good use of the photo! A great message as well. 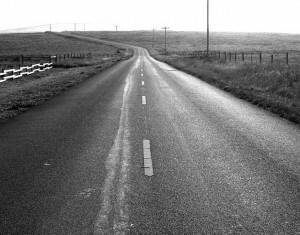 It’s a journey and the road is long, dull, uneventful, uninspiring, tiring… Well, the road is nothing. It’s all your spirit. Keep inspiring and you will be inspired. Hi Chris, Another exceptional story. Keep on schlepping. You may have 7199 subscribers but its shared with a lot more than that number. I share with my immediate family and that’s 5 more. How many more people like me out there are sharing. You have a ‘Gift”, continue using it as it makes a difference to so many people. Chris – I am a fanatical Possums follower and I recommend your blog to anyone who will listen! I am horrified that you feel unappreciated!! Just because numbers aren’t growing doesn’t mean that you aren’t making an impact on the many dedicated followers every week. So often I am feeling down or unmotivated and a Possum arrives that just talks to me and lifts me up. You make a difference – keep on doing it! Keep up the great work. I hadn’t read the blog for a few weeks and just came back to it and I am feeling inspired for the day ahead after this post! The best things in life are free! Your latest article (Feb 2016) on Jake Bailey really touched me, and I watched his speech on youtube, and cried the entire time. Such a deep message from one so young. Praying for him and wishing him the best. So thank you, and I wanted you to know that I love Wrestling Possums!